Vein problems are common in the U.S. and around the world. By age 50, nearly 40% of women and 20% of men have some type of significant vein disorder. Leg pain, swelling, bulging varicosities, and ulcers caused by vein insufficiency are all common reasons our patients seek treatment. Spider veins are often unsightly & embarrassing, and prevent many of our patients from wearing shorts or bathing suits. What causes unsightly visible veins? Blood is carried through arteries from the heart to the rest of the body, and returned to the heart through the body’s veins, called the venous system. Visible and unsightly veins usually result from an underlying problem in this system, just below the skin. 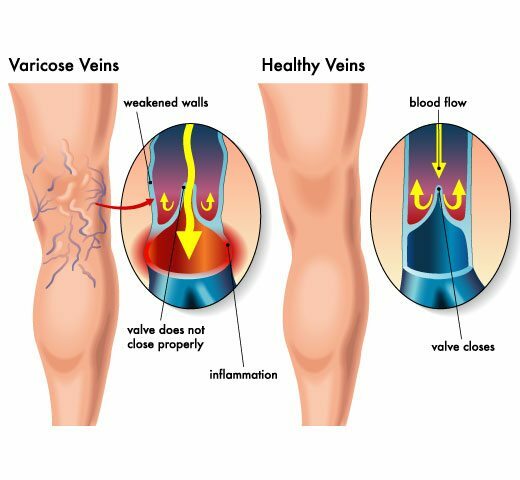 Weak inner vein walls and abnormal valves in the venous system are common causes. The valves act as one-way flaps, preventing blood from backing up and pooling in the lower legs. When these one-way valves don’t work properly, blood then may flow backwards, causing the veins to enlarge and become varicose. The technical terms for this condition are venous reflux or venous insufficiency. What type of treatment a person needs is directly dependent upon how advanced their venous insufficiency is. What are the signs and symptoms of vein problems? What are the risk factors for varicose veins and spider veins?